MilkPrice: Exports of Cheese Skyrocket! 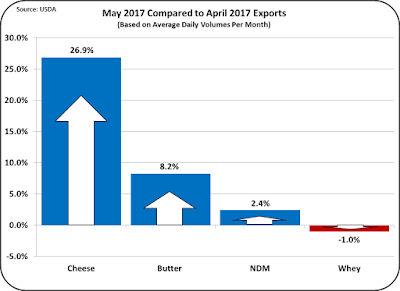 Export and import data for dairy products was updated through May 2017, this past week. Export increases were far above expectations. 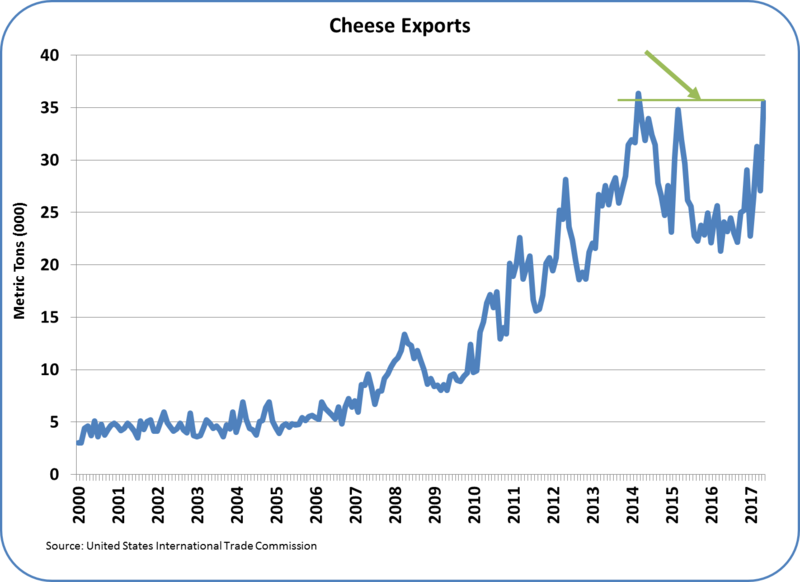 The most needed increase was for cheese exports. U.S. cheese inventories are high and as a result, prices have been low (see prior post). In May, cheese exports increased by 26.9% vs. the prior month. The volume of cheese exported was the second highest ever. Currently U.S. cheese is the lowest priced cheese in the international markets. This will clearly have a major impact on reducing the U.S. cheese inventories. With lower domestic inventories, cheese prices should recover and with that, Class III milk prices will recover. 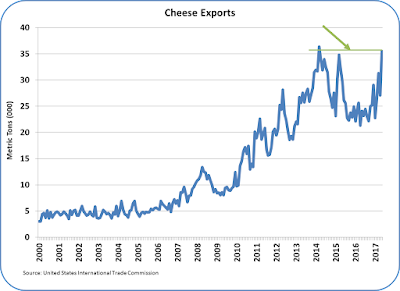 Chart II below shows the volume of cheese exports since the year 2000. 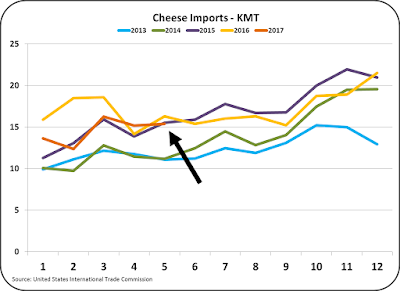 May's export volume of cheese was the second highest ever and just short of a record! It was not just a nice increase over the prior month, or a big percentage on a small base, or an unusual month. It was a continuation of the trend started at the beginning of 2017. 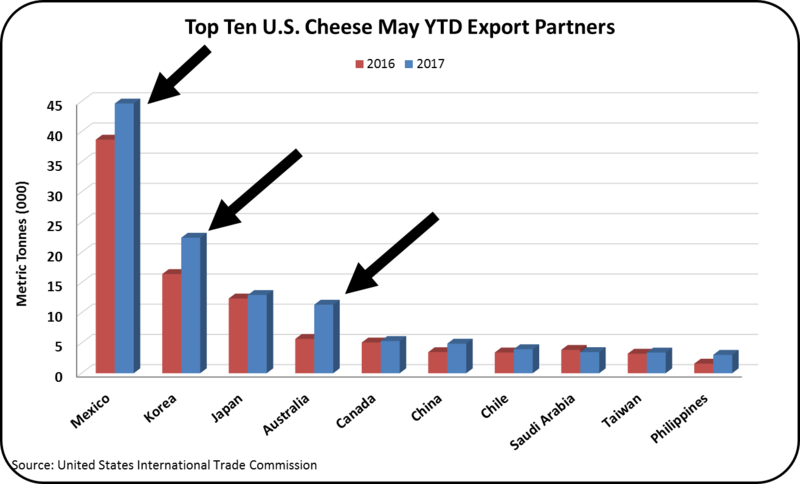 The May exports accounted for 7.4% of U.S. cheese production. Where did all this cheese go? Chart III below shows the YTD metric tons of exports. The biggest gains in exports came from Mexico, South Korea, and Australia. Japan also has a nice increase. How is this happening? U.S. cheese is now the cheapest cheese on the international market. It is priced below Oceania and European cheese and below the most recent NASS price of U.S. cheese. Can this continue? That's a tough call. As will be covered later in this post, the USD is still very strong vs. other cheese exporting countries and vs. the major U.S. export customer, Mexico. So, the question is, was this just a one month bleep or the beginning of a new trend? As shown in Chart II, there is a trend of gains over the last six months. If these gains continue, they will certainly not be linear. Gains, as always, do not happen is a straight line. There are always ups and downs in the path of growth. Because this change in cheese exports is so significant, the export/import data is also reviewed below in three charts, which show exports, imports, and net exports on a year by year basis. 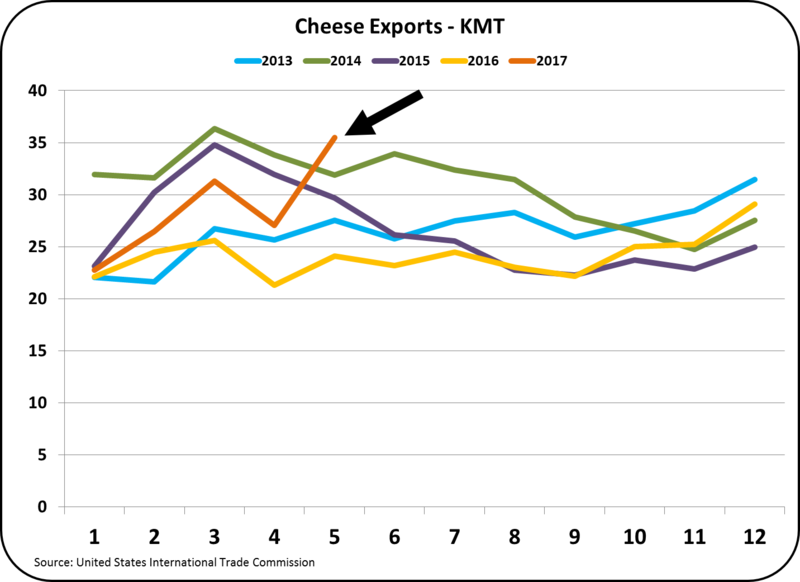 Chart IV shows 2017 cheese exports relative to the prior four years. May 2017 was an all-time record for this month. It is only slightly below the all-time record month of March 2014. Imports of cheese have been flat for the last three months. While there has been no decrease in imports, there have been no significant increase. 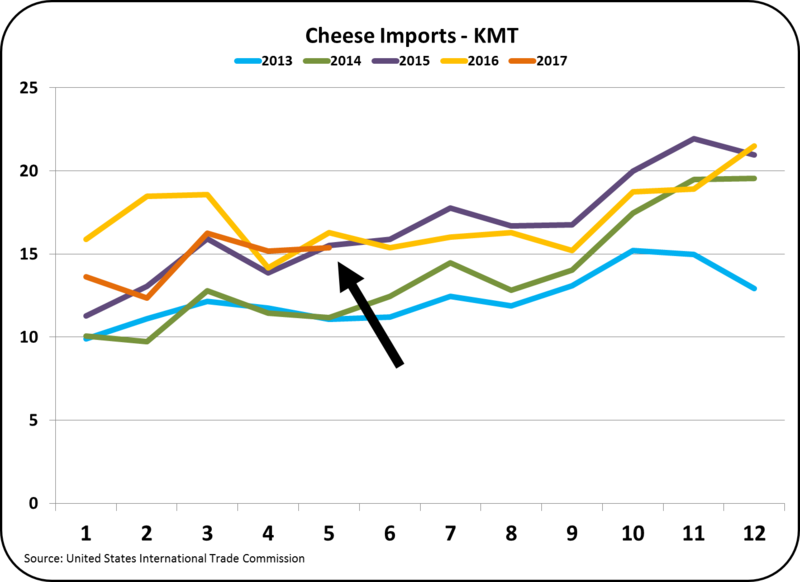 Cheese imports are currently running at the level of the prior two years. 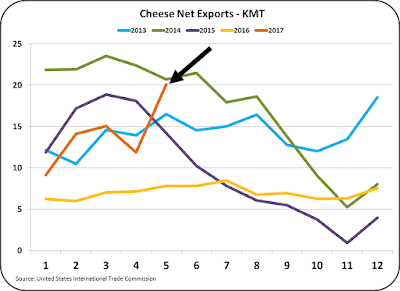 As a result, cheese net exports were near a record level for May. 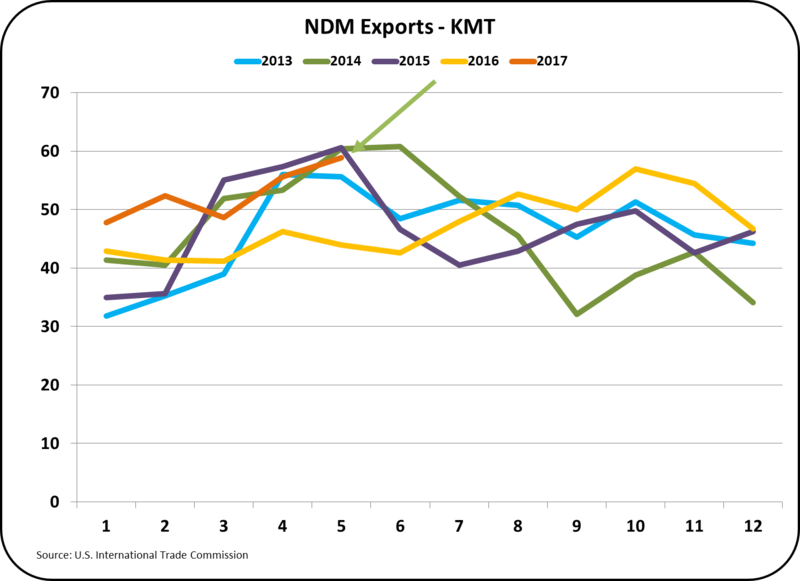 Nonfat Dry Milk (NDM) set an all-time export record in May. 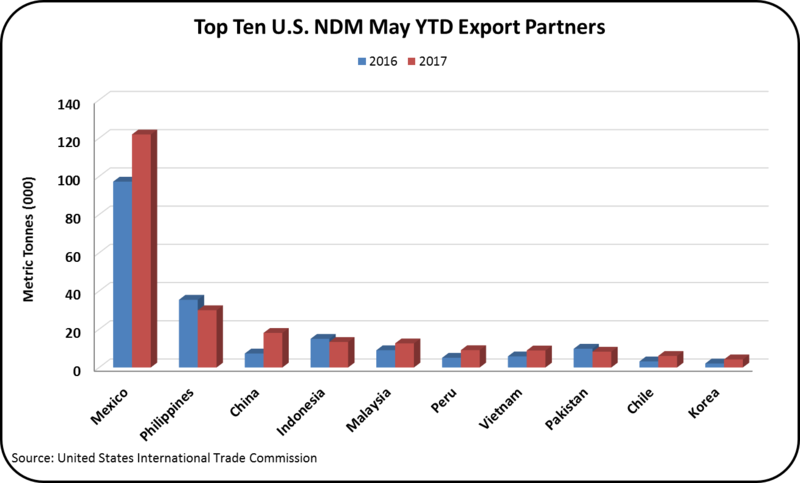 The exports represented 59% of NDM production for May. 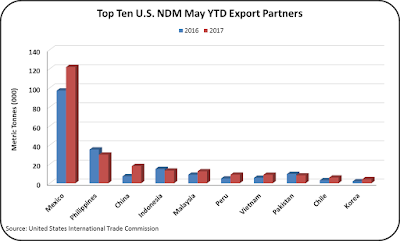 NDM is by far the largest U.S. dairy export product. Where did all this NDM go? The vast majority of this went to Mexico, with a mixture of other countries making up the balance. The U.S. struggles for enough butterfat to meet the domestic demand for butter. As a result, an increasing amount of NDM is available. Prices are not great, but the international markets do present a selling opportunity. 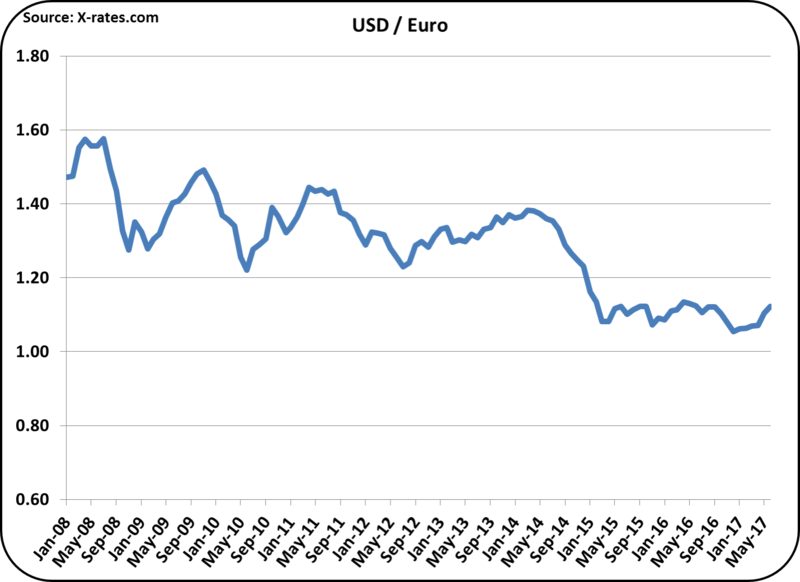 Exchange rates were covered in detail in last month's post. The good news reviewed at that time continues in June. The USD has again weakened against the three major currencies important to U.S. dairy exports. 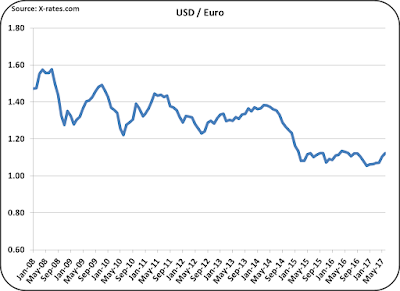 The USD/Euro showed continued progress as the ratio is currently at 1.14. At the beginning of 2017 the ratio was 1.08 and last month it was at 1.12. As the USD weakens against other currencies, competitive pricing and exports will benefit. 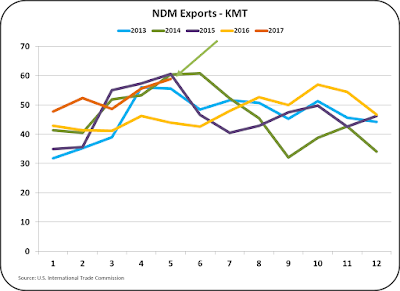 The EU is the biggest dairy exporter and a strong competitor especially in the NDM and Skimmed Milk Powder market. The second biggest dairy exporter is New Zealand. 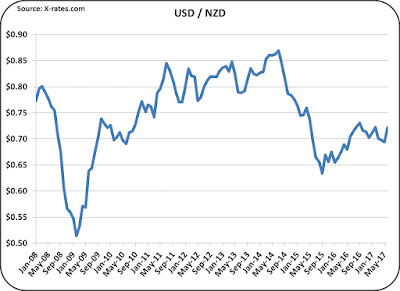 In the prior months analysis of exchange rates, the USD was continuing to strengthen against the NZD. 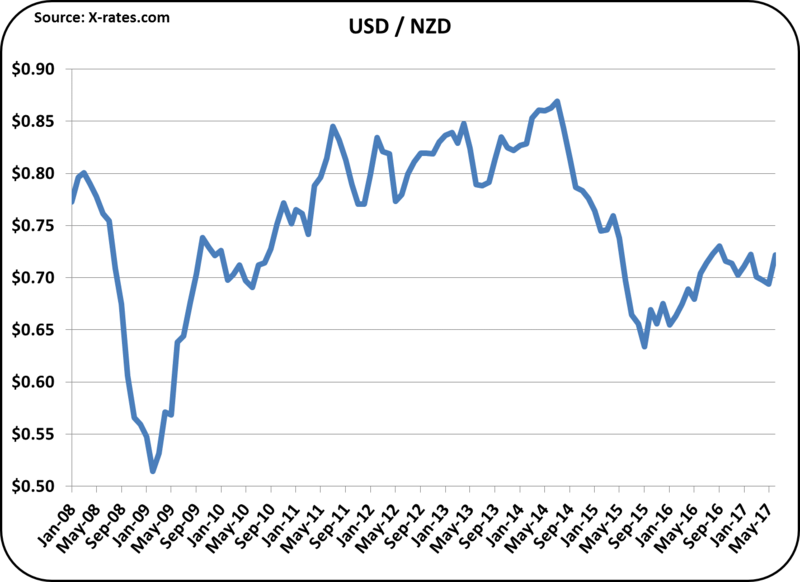 At the current time, there has been a major turn around and the NZD is now strengthening against the USD. The biggest customer for U.S. dairy products is Mexico. 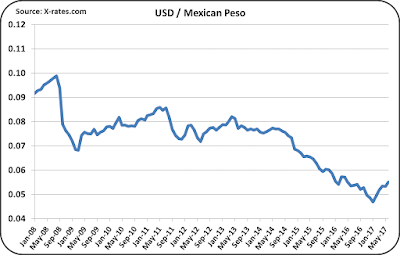 After a three-year decline, the Mexican Peso is currently strengthening. 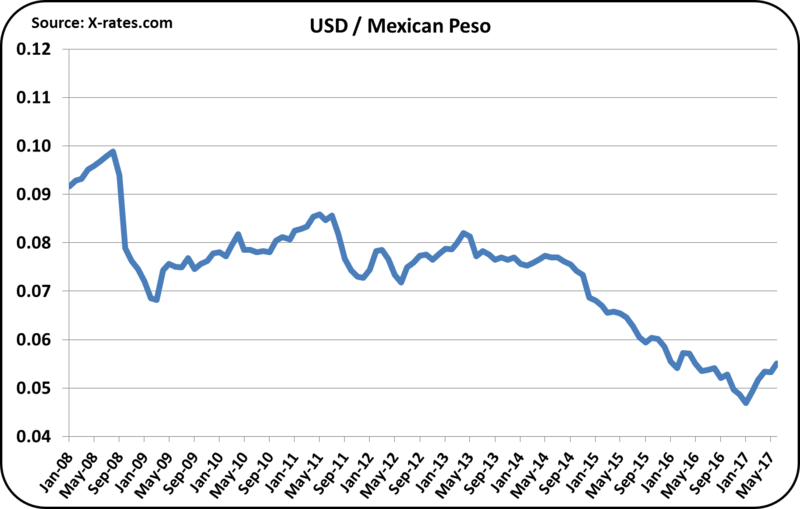 This makes U.S. produced dairy products lower priced for Mexican buyers. 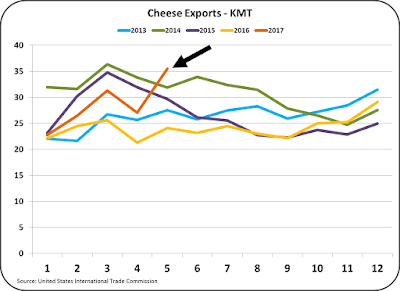 In all, the current increase in exports and especially the current increase in cheese exports is extremely encouraging. The trend to a weaker USD are also very encouraging. After many months of difficulty with the volume of dairy exports, May was extremely positive and hopefully expresses a change in trends to further increasing dairy exports.